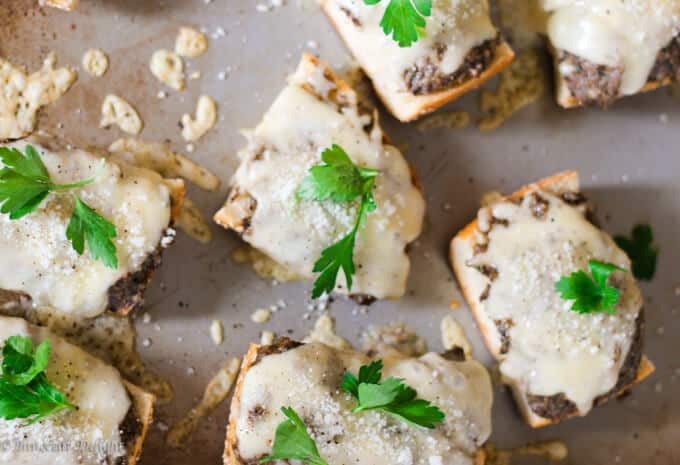 These Mushroom Pesto Toasts with Fontina Cheese are very unique and sophisticated and a huge crowd pleaser. Wild porcini mushrooms combined with fresh sauteed crimini mushrooms, roasted garlic, walnuts, parsley, and pecorino cheese make for an irresistible pesto! 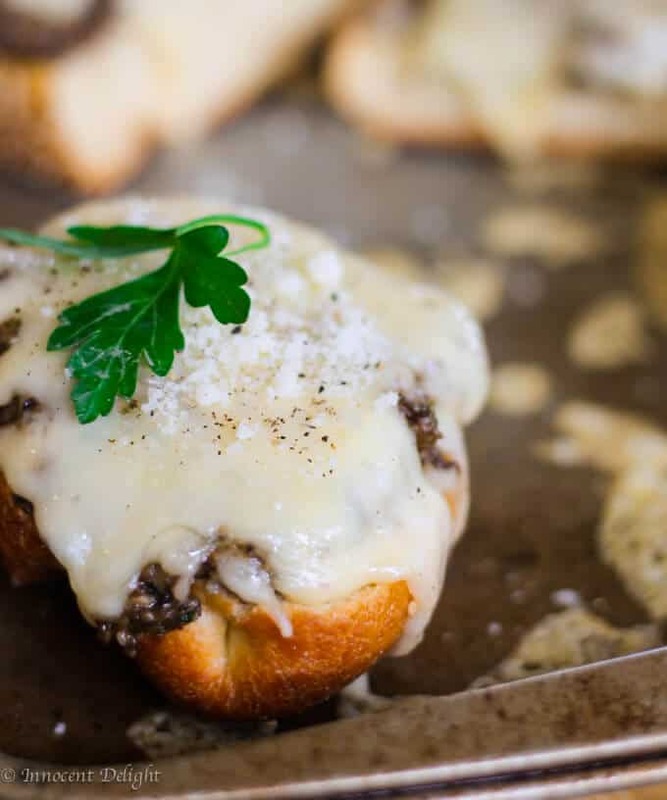 Place it on pieces of French bread, top it with Fontina, toast them, serve and watch the crowd. If you like porcini mushrooms you may also want to check my famous Creamy Wild Mushroom Sauce. It’s amazing! This post was originally published on May 29, 2014, and since then was updated to provide additional information. 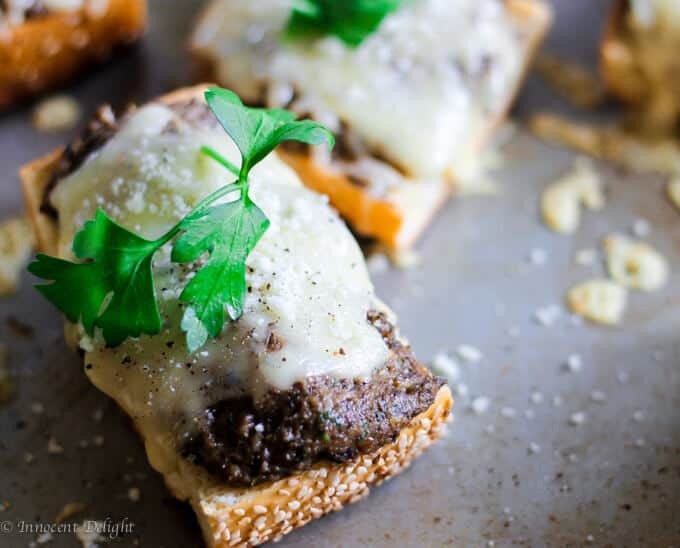 These Mushroom Pesto Toasts were inspired by the dish that I once saw on Food Network: Grilled French Bread Pizza with Mushroom Pesto and Fontina Cheese I where Bobby Flay was making it on the outdoor grill. I made these Mushroom Peto Toasts for some house guests in the middle of a brutal New York winter. Given the frigid temps, obviously, this means no outside grill. Instead of grilling I decided to sautee my mushrooms in a pan, and use the oven to bake my toasts. 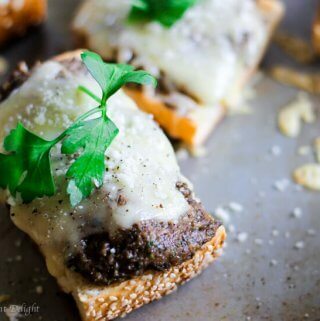 Let me tell you my version of these mushroom pesto toasts came out so delicious that my guests and I were in heaven. The richness of the pesto, with a hint of Pecorino Romano – with its smooth texture – and then the gooey fontina…..mmmm….it created a happy dance in my mouth. My guests totally favored these over any other dishes that I’d made that day and they couldn’t get enough. See the printable recipe below for exact measurements, instructions and easy steps to follow. Roast about 30 minutes until cloves are lightly brown and squeezable. 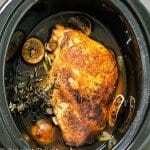 Place dried porcini mushrooms in a pot of hot water and let it cook on low heat for about 20 minutes. Carefully remove porcini mushrooms from the pot with a slotted spoon, paying attention to not stir the water as there may be dirt at the bottom of the pot. Place them in the bowl of your food processor. You may add a few tablespoons of cooking water as well. 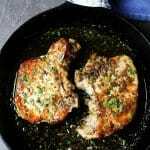 In a large skillet, heat up 2 tablespoons of cooking oil. Add cut up cremini mushrooms and do not move them for about 5 minutes. Do not add any salt at this time as you don't want the mushrooms to release water. After 5 minutes, stir the mushrooms and add salt and pepper. Let it cook for about another 5 minutes. Add mushrooms, roasted garlic pulp, toasted walnuts, parsley, and thyme into a food processor and process until finely chopped. While the food processor is running slowly add extra virgin olive oil until smooth. Add ¼ cup of Pecorino Romano cheese and pulse to incorporate. Recipe adapted from Bobby Flay. This sounds so good I might just make a meal out of it and not share, haha! Yum! 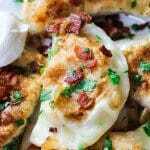 These make such a great appetizer for any occasion!!! These look like a great appetizer! Very healthy and light! This looks 100% like my kind of dish. I’ve never heard of Fontina cheese before though (hey Sweden…) – but it says Pecorino in the description so I guess I can use any Pecorino cheese?